"Very tender traditional roast made with beef gravy." Pour the gravy into a slow cooker, and mix with water until smooth. Stir in half the thyme, rosemary, sage, and onion salt. Mix the remaining thyme, rosemary, sage, and onion salt in a bowl, and stir in the olive oil to make a paste. Rub the paste all over the beef roast, and place the roast into the gravy. Place the lid on the slow cooker, and set to low setting. Cook until the roast is very tender and the gravy is thickened, 8 to 9 hours. 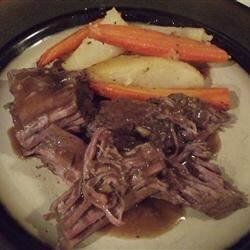 See how to make a simple and satisfying 5-star pot roast in your slow cooker. Place any desired vegetables in the slow cooker with the gravy and water in step 1. If you prefer, set cooker to High setting and cook 4 to 5 hours. I added the same amount of parsley as the rest of the ingredients (to make it officially simon and garfunkel style) and it was very good. I will make it again!!! Way too much rosemary....but I love the idea of the gravy!! This was really yummy. I only put in a teaspoon of each spice though and I added pepper. Made French Load to go with it! i did make my own gravy for this. after i tried it i added some garlic... i think it has too much water but the taste is good. Sounds good, but.... Where is the parsley?